The islanders have been this Gold Cup’s only side to successfully frustrate Mexico both at open play and at set pieces. With the quarterfinals now completed, it’s easy to see that it will be no piece of cake for any of the remaining four teams. Jamaica faced Canada in a match that was anticipated because both teams had never met in the Gold Cup previously. However, the air was quickly taken out following a 6 th-minute goal by Jamaica’s Shaun Francis. The islanders largely dominated the game through Romario Williams’ 50 th-minute goal. Canada did respond with Junior Hoilett’s 61 st-minute rocket into the top corner to give the Maple Leafs some life, but they fell short. The second quarterfinal matchup featured Mexico and Honduras, a side which thanks to Florent Malouda’s ineligibility made it to this point without scoring a single goal. Mexico started the match off with a bang, when Rodolfo Pizarro scored in the 4 th minute. It was all that Mexico needed as 'El Tri' managed to hold off every Honduran attack. Jorge Luis Pinto is being already widely criticized back in Honduras. So the second semifinal is set. 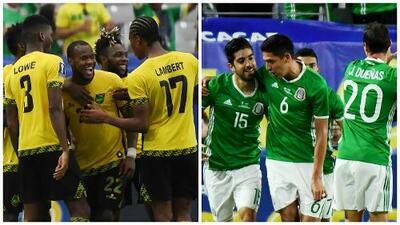 Mexico will play Jamaica on Sunday at the Rose Bowl in Pasadena, California. In a rematch of the 2015 Gold Cup Final, it promises to be a hard-fought affair. However, when the teams played in the group stage, it was a tame match, so hopefully this round will be much harder fought. After all, the winner gets to compete for the Gold Cup.